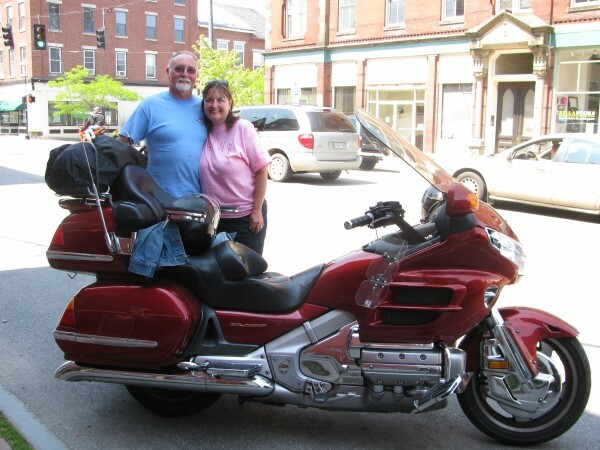 Bob and Teresa Coffman of Wayland, Mich., said that they were spending two and a half weeks and about $4,000 on a motorcycle tour to the Maine coast and back again. "You're going to get a few of those people who like to rev it up through the town," Bob Coffman said. "Those are probably the minority." Some downtown businesses chose to make it clear that they support motorcycles after the recent controversy over motorcycle noise. 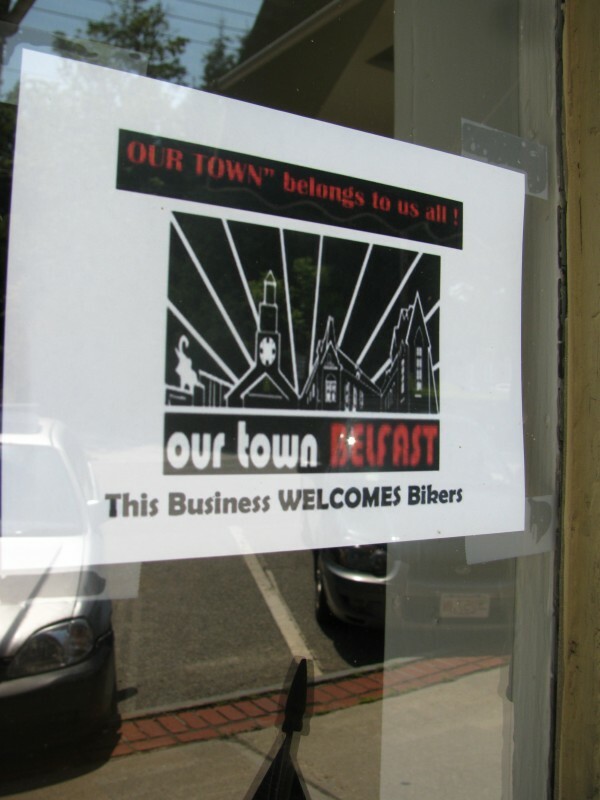 BELFAST, Maine — The low rumble of a few motorcycles that could be heard in downtown Belfast on Friday was music to the ears of many downtown merchants, who are worried that a proposed biker boycott of the city could have a detrimental effect on business. “I do not want them banned,” said Neal Parent, proprietor of the Parent Gallery at the corner of High and Main streets. That succinct sentiment was echoed by many others around town, although not all, as Belfast residents wrestled with the controversy about noisy motorcycles that began in force after City Councilor Roger Lee asked last week at a regular meeting if the bikes could be banned from some downtown streets. His comment was made after the council heard complaints from several residents who said they believe some motorcycle noise is distressingly loud in town, and asked if the council could do something about it. Although Lee’s question was dropped, and the council voted only to place about a half-dozen signs around town that exhort motorcyclists to “please drive quietly,” for many riders, the damage was done. A Facebook page inviting thousands of people to join in a summerlong business boycott buzzed with comments, many of which seemed to highlight the frustration many riders feel about Belfast and even the whole state of Maine. Tina DelSanto, who co-owns three downtown eateries, said she has been trying to bring a commonsense approach to the discussion. She pulled out a “Bikers Wanted” poster she had made four years ago for one of her restaurants. She said that at times, 30 bikes will be parked outside her Front Street Pub. After the riders stop for lunch, they will walk around Belfast and shop. But in the last few days, she hasn’t seen as many motorcycles cruising by. That might be due to the rainy weather — but she worries that it might be the boycott. “How can you organize something against your friends and neighbors, when you could just speak up at the council meeting?” she asked. According to the Facebook page for the biker boycott, many riders intend to do just that. The next city council meeting is scheduled for Tuesday, July 3, and people such as DelSanto anticipate there will be a crowd. The boycott is a big topic of conversation around town, according to the restaurateur. “It’s bringing up old, unresolved issues,” DelSanto said. Those issues include the hot-button debate over whether or not Belfast should allow big box stores such as Walmart to come to town. That might be a question that is hard to put to rest, but the motorcycle dilemma shouldn’t be, according to merchants such as Josh Ard of Permanent Expressions tattoo parlor. On Friday afternoon, one motorcycle — a shiny Honda Goldwing — was being ridden by two travelers from Michigan. Bob and Teresa Coffman of Wayland, Mich., said they were spending two and a half weeks traveling to the Maine coast and back again. They stopped in Belfast for a snack and were walking around the shops. Altogether, the couple estimated that they had spend about $4,000 on their vacation. “We like touring through all the small towns,” Bob Coffman said. When told of the motorcycle controversy, the couple said the cross-country riders they meet tend to be the opposite of outlaws. One man shopping in downtown Belfast who did not share his name made a comment that others have been echoing. He registered surprise that motorcyclists would be so sensitive to a single comment. “It’s not in the spirit of Hell’s Angels,” the shopper said.